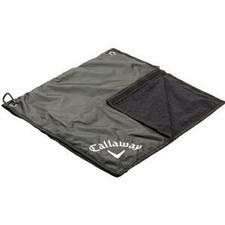 Prepare yourself for any change in the weather with the Callaway® combination rain hood golf towel. When weather gets questionable, slip this nylon waterproof rain hood over the top of your bag for fast and easy club protection. Velcro® sides help you quickly access your clubs while keeping them dry during a heavy rain. During favorable conditions, use the included carabiner clip to secure the hood to your bag for use as a golf towel. Towel measures approximately 17.5" x 17.5"
If you have any more questions about the Callaway Golf Rain Hood Towel -(Waterproof Bag Towel Hood w/Intergrated Towel); do not see the model you are looking for; need custom options; or prefer to not purchase online, then please call us at (630) 656-1291.